ES LA MAS SENCILLA Y ECONOMICA PARA LOS DIVERSOS USOS, TANTO EN LA INDUSTRIA Y EL COMERCI, COMO EN EL USO DOMESTICO.FACIL MONTAJE Y AMPLIAS POSIBILIDADES DE ADAPTACION. PESOS HASTA 250 KG. BANDEJAS NUEVAS DE COLOR GRIS 90 X 30, 90 X 40 Y 90 X 50. COLORES Y OTRAS MEDIDAS POR ENCARGO. ANGULOS RANURADO ACABADO GRIS. MEDIDAS 40 X 40 MM. ALTURA DE 2 MT, 2.50 MT Y 3 MT. IDONEOS PARA INTERIOR Y EXTERIOR Y AMBIENTES HUMEDOS POR SU RESISTENCIA A LA CORROSION. DISPONEMOS DE AMPLIA VARIEDAD DE BANDEJAS Y ANGULOS DE OCASION. ESTANTERIAS DE PALETIZACION DE GRAN CARGA, SISTEMA CONVENCIONAL, CON ACCESO DIRECTO Y UNITARIO A CADA PALET. IDEAL PARA ALMACENAR DE FORMA SEGURA Y ORGANIZADA EL MAXIMO NUMERO DE UNIDADES DE CARGA APROVECHANDO EL ESPACIO DISPONIBLE. 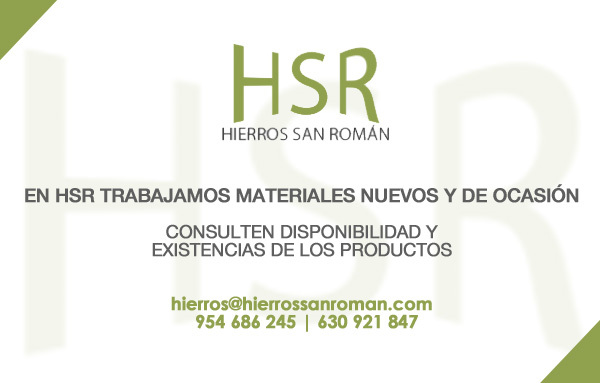 EN HIERROS SAN ROMAN NOS ADAPTAMOS A SU NEGOCIO Y A SU ESPACIO. PREPARAMOS A MEDIDA SU INSTALACION. PRESUPUESTOS SIN COMPROMISO, POSIBILIDAD DE MONTAJES Y TRASLADOS. STOCK ACTUAL: MECALUX - ESMENA DESDE 2 A 6 METROS, GROSOR DE PUNTAL DE 80 MM Y 100 MM, ANCHOS DESDE 0.80 MT A 1.10 MT. LARGUEROS: PARA TODO TIPO DE CARGAS DESDE 1.500 A 3.600 KG. MEDIDAS DESDE 1.80 MT, 2.20 MT Y 2.70 MT EN VARIOS GROSORES DE CARGA. TORNILLERIA DE SEGURIDAD.